Tazza D’Oro has received a new coffee – Kenya Nyeri – Jungle Estate! The Kenya Nyeri is an exceptional shade grown, micro-lot coffee. Batdorf and Bronson purchased this coffee through a program called “Second Window“. This program allows licensed agents to sell exceptional Kenyian coffees without passing the green coffee through governement run auctions. Historically, these auctions were held on behalf of the finest coffees grown in Kenya thus yielding selling prices four times higher than the same quality coffees from either Guatemala or Columbia. Batdorf and Bronson purchased the Kenya Nyeri directly through the growers at Jungle Estate allowing price transparency and quicker delivery of the green coffee. The owners of the farm call it “Jungle Estate” because of the incredibly dense indigious bush that grows on the land. We received and cupped the coffee on Friday afternoon. By Saturday morning we had already sold several French Presses and had a few ourselves. Collectively, we described the coffee to be sweet, spicy, scotch-like, grapefruity, apricot-like with an smooth finish. Come and experience the Jungle! 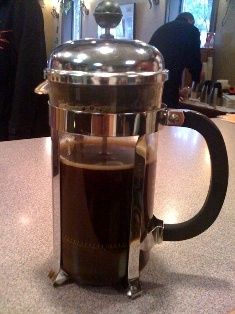 As always, with our single origins, this coffee will be brewed in a French Press.